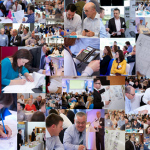 In all this was our most successful event to date, with over 200 people from businesses involved in Research & Innovation, and colleges involved in Design, in attendance. International speakers from the USA, UK, Russia, France, Germany and Ireland shared their experiences of how the area of Design is contributing to Innovation. Lara Hanlon, a design graduate of IADT, shared her experience of joining IBM as a Designer this year and bringing her skills to their Innovation Centre (see her blog attached). Businesses such as Dell, SAP, IBM, Bord Fáilte, Kerry Group and Fidelity Investments all shared their experiences of how Design Thinking is transforming how they do their Innovation and making a real difference to their operations. There was also a huge range of exhibitors, predominantly from colleges and institutes who are involved in Design and Design Education. There is a significant appetite among those who attended the conference, and many others who could not, to learn more about these techniques. To that end IRDG is currently developing the Design Thinking Series 2015 which will see a range of activities to support Design Thinking learning throughout the year and beyond. Watch this space!